Finished apperance when saddlebags are removed! 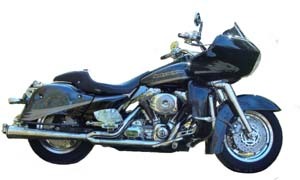 FSK: Now have two bikes-in-one and get that nostalgic 50's look with your 2014-present Harley-Davidson Touring bike in 30 seconds. 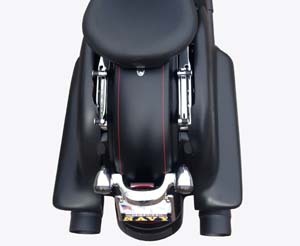 Allows you to change the look and function of your touring bike to a cruiser in less than 30 seconds and then when you want to change back it's just as fast. You will now have two bikes in one; a touring bike for your road trips and a cruiser for around town. 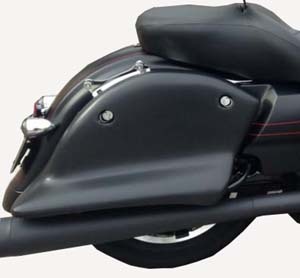 No modifications are required; simply remove the saddlebags and install the skirts in their place. Made of high quality hand laid fiberglass. These parts will need finish work (sanding and paint). 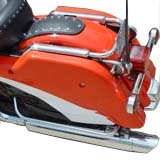 You will also need to purchase from H-D, qty 4 Part #: 90200611 and 4 Part #: 90200467 prior to installing on your bike. 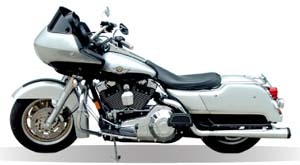 Fits H-D touring motorcycles 2014-present. 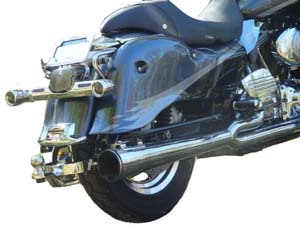 Note: The Fender Skirts can be installed on 1993-2013 touring motorcycles with a small modification to the position of the front Dzus recepticle. QSK: There is not a faster more dramatic change to your bagger! 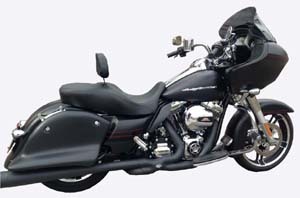 You best alternative to Saddlebags. Fast change out from Saddlebags to Skirt. No modification to the motorcycle required...it's like having two bikes. Why not go bagless! Fits: MY '97 to '08 Dressers.